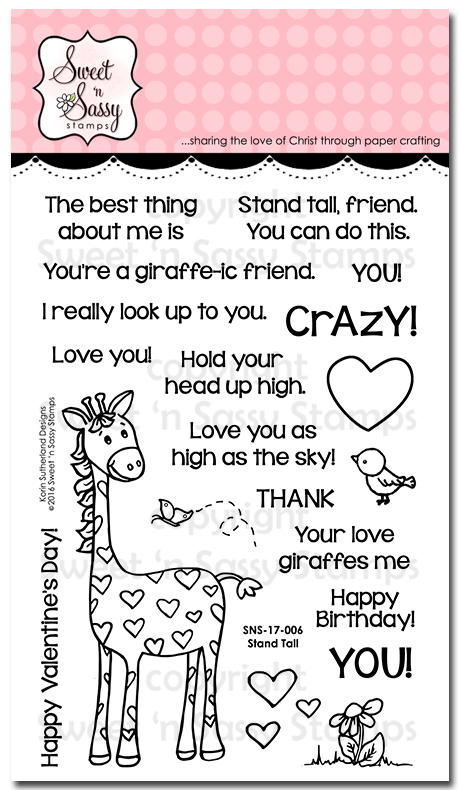 I have had a very busy week and was so thankful that I had a chance to play around with the brand new Sweet ‘n Sassy Stamps (SNSS) Stand Tall Clear Stamp Set (designed by Korin Sutherland) today! I think this set is so cute and love all of the different sentiments. 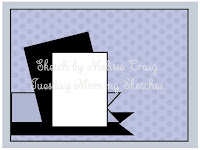 I also wanted to participate in a few online challenges and decided to incorporate the Tuesday Morning Sketches #385 Challenge along with the Sugar Pea Designs Mix It Up #27 Fresh Inspiration Challenge into the design (both are challenges that I have not participated with in quite a while :-)). I hope you will find time to visit both challenge sites as well as the SNSS Blog- my "sisters" on the SNSS Creative Team post projects throughout the month and in addition to the above challenge galleries, you would have inspiration galore!! 1). 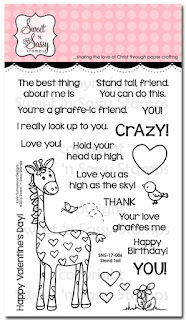 Ink the SNSS Stand Tall Clear Stamp Set giraffe image with embossing ink, stamp onto a piece of white cardstock and color the water-based markers. Add white highlights to the eyes with the Sharpie Extra Fine White Paint Pen. 2). Fussy cut the giraffe and set aside. 3). Die cut a piece of white and patterned paper with a stitched rectangle die, mount onto chocolate cardstock and trim close to the edge. 4). Emboss a piece of designer paper with a lattice embossing folder, trim and mount onto flamingo cardstock, trim and mount onto the chocolate card base. 5). Die cut two banners with a stitched banner die, adhere both directly to the card front per the sketch and add the patterned paper rectangle. 6). Ink the group of hearts image from the SNSS Stand Tall Clear Stamp Set with archival black ink, stamp onto the white die cut rectangle and color with a flamingo water-based marker. 7). Mount the white heart rectangle onto the card front with dimensional foam, add the fussy-cut SNSS Stand Tall giraffe image. 8). Heat emboss the sentiment from the SNSS Stand Tall Clear Stamp Set with white embossing powder onto chocolate cardstock, hand cut the banner and mount onto the card front. 9). Die cut the hearts using the SNSSPick Me Up Dies- a small and large heart from flamingo cardstock and a large heart from chocolate cardstock. Add to the card front to finish off the card. 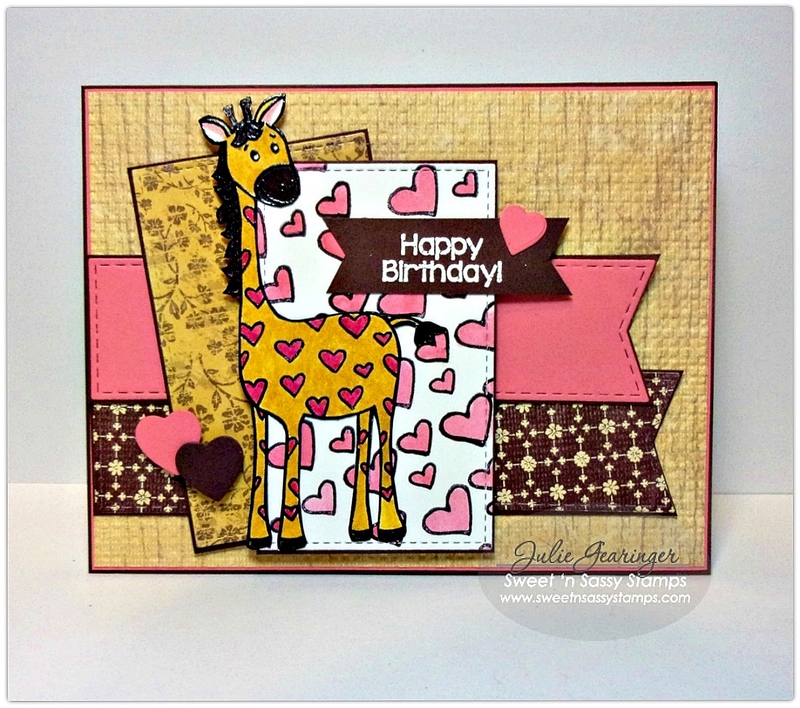 I love this cute giraffe image from the SNSS Stand Tall Clear Stamp Set and had fun designing this card! I hope I have inspired you to create something this week- thanks again for taking the time to visit! Hugs and I hope you have a fabulous week, sweet friends! Very cute! Thanks for joining us at Tuesday Morning Sketches.